Removing 104,937 lbs of Debris! The Marine Debris to Energy Project (MDEP) is an effort to study and cleanup marine debris from shorelines and coastal waters off New Hampshire. This is done through involving fishermen in disposal of derelict gear, conducting beach cleanups, surveying areas in the Gulf of Maine for underwater and floating debris, and integrating project data into this web site. Teachers: Check out our interactive web site, and download lesson plans! Search our GIS maps for litter spotted at sea. Researchers will make an initial assessment of the volume of underwater marine debris using sonar for the first time for this purpose in New Hampshire. 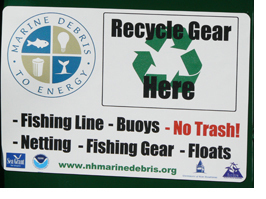 Commercial and recreational fishermen will become actively involved in removing DFG at sea and collecting it in the Waste Management dumpster at theYankee Fisherman's Co-op. 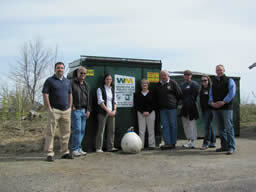 Fishermen will have access to bins where they can discard their fishing line for recycling. Anyone collecting marine debris will be able to report it online via an easy Web interface. Cleanups along the New Hampshire coastline will expand, involving more volunteers and creating more aesthetically-pleasing, healthier and safer beaches. Members of the public, schools, and scientific researchers will have access to interactive marine-debris data and GIS maps. Teachers and their students across the world will have access to marine-debris data to use in their lessons, and local schools will be able to work directly with project investigators and partners in viewing data, participating in cleanups and contributing to the database. Project staff and others around the world can use the data and protocols developed in this project to target further pollution-prevention and outreach efforts. The quantities of debris in the ocean and on the shore, potentially harmful to wildlife, people, vessels, and the economy, will diminish.